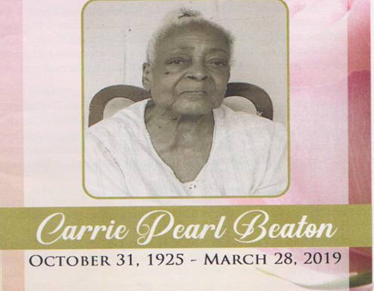 Carrie Pearl Beaton 93 a resident of Selma entered eternal rest 3/28/2019 in Selma, AL. Funeral Services will be held Saturday, April 6, 2019 11:00 a.m. at Summer Grover Missionary Baptist Church with Rev. W. Jackson, Pastor officiating. Burial in Shiloh-Benton Church cemetery Benton, AL. Walker Mortuary directing.